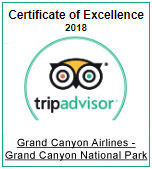 Guests aboard the Rainbow Bridge Air Tour are treated to breathtaking aerial views of some of the most impressive sights in the American Southwest. You'll see Glen Canyon Dam and the expanse of Lake Powell spread across the horizon from the window of your sightseeing airplane. This massive lake actually boasts more shoreline than the entire East Coast of the United States, and is a vacation destination for thousands of people annually. Next you'll see Rainbow Bridge, an immense sandstone curve that was eroded by wind and flowing water over millions of years. It is the tallest naturally-formed bridge in the world - and reasonably fragile. These same forces of nature that created the bridge will ultimately be the cause of its collapse. We consider ourselves fortunate to have the opportunity to show so many passengers this incredible landform while it still stands tall. Arrive at the terminal 30 minutes prior to departure for check-in. Board your airplane and depart terminal for views of Lake Powell and Rainbow Bridge. Enjoy the amazing views of the massive expanse of Lake Powell and Rainbow Bridge, the tallest natural stone bridge in the world. Arrive back at the terminal with photos and memories to last a lifetime.